Staflund’s respect for the writers at the heart of the publishing process makes this a worthwhile addition to any aspiring author’s bookshelf. It’s easy for an author to get lost in the wild world of publishing options today, where traditional, independent, and supported solutions abound. Here with help in navigating this maze is Kim Staflund, publisher at Polished Publishing Group (PPG), a hybrid support service for self-publishing authors. 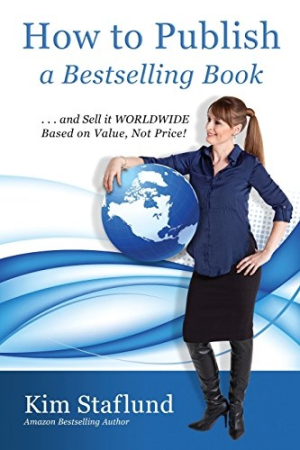 How to Publish a Bestselling Book … and Sell It WORLDWIDE Based on Value, Not Price! not surprisingly puts PPG front and center, but it also offers an introduction to topics every author needs to understand, from copyright law to sales tactics. Staflund has personal experience as an entrepreneur and author—she previously wrote the Amazon bestseller How to Publish a Book in Canada…and Sell Enough Copies to Make a Profit! Her business mindset is clear in her current work: she focuses on sales. An author’s bottom line is the key component of Staflund’s advice for planning a book launch. What sets her advice apart is emphasis on leveraging the value a book offers to an audience to make the most profit. This focus on content and audience, rather than price point, offers authors a new way to think about what they are selling and who is going to buy it. Staflund writes directly to authors, particularly new authors, posing and answering questions such as, “Do you need an agent?” and “What is copyright?” Much of her material is clearly self-promotional, such as her explanation of why authors need support services like those offered by PPG. In other places, Staflund’s choice of words more subtly suggests that a company like PPG is the best way to go. Writers considering their publishing options would do well to consult additional resources on these topics. With the book’s biases held firmly in mind, authors will find that Staflund also presents road-tested tips and tricks that will serve them well, whether they are clients of PPG or not. Some advice covers the familiar territory of book signings and launch parties, but Staflund also explores the relatively new territory of video trailers, pay-per-click advertising campaigns, and search engine optimization. None of the topics are exhaustive—for instance, she includes only one publication in her discussion of paid book reviews—but they provide a good introduction for newcomers who want to understand the latest sales methods. How to Publish a Bestselling Book wraps up with specific logistical advice on things like manuscript word count, graphics, and formatting. Much of this content can be found elsewhere, but Staflund lends a personal touch to what can be a tedious and time-consuming process. In addition to talking about the need for editing, proofreading, and possibly ghostwriting, Staflund acknowledges the emotional process writers go through during revisions to their manuscripts. Her obvious respect for the writers at the heart of the publishing process makes this a worthwhile addition to any aspiring author’s bookshelf.